LMS Chairman: Booking for Walsingham Pilgrimage open! Pope Francis, Evangelii gaudium: “Journeying together to shrines and taking part in other manifestations of popular piety, also by taking one’s children or inviting others, is in itself an evangelizing gesture”. Let us not stifle or presume to control this missionary power! 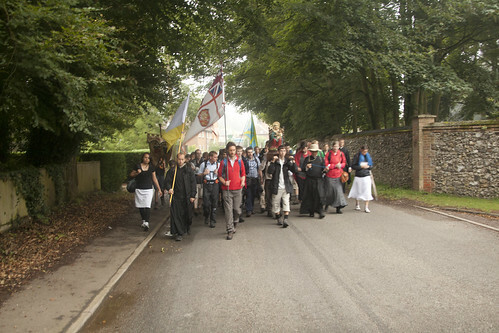 The Walsingham Pilgrimage, a walking pilgrimage from Ely to Walsingham over three days, is the most exciting new event of recent years. Please book sooner rather than later, to assist our planning! The dates: pilgrims gather in Ely on the evening of Thursday 21st August, and walk Friday, Saturday, and Sunday (24th) morning, when we have a High Mass in the Shrine at 2pm. For those staying an extra night, there is another Mass, in the Slipper Chapel, on Monday morning. All our Masses are of course open to the public. The High Mass in the Shrine on Sunday is always joined by many pilgrims in cars, and a coach organised by the LMS comes from London. 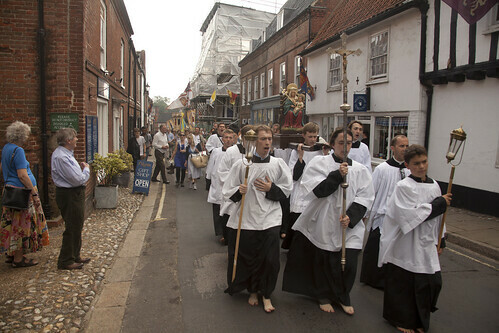 This is followed by a procession to the site of the Holy House in the town of Walsingham. The Pilgrimage is for the Conversion of England. And how England needs it! 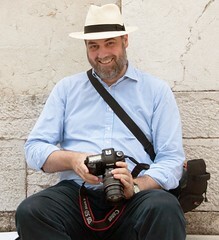 Loads of photos of last year's pilgrimage can be seen here.